Digitalization, changes in corporate culture, and new business models – use the challenges that the digital transformation presents to optimize your company. Digitalization poses a set of completely new challenges to companies. New business models and markets are emerging faster than ever before. Existing companies and their business models are increasingly under threat due to new competitors. This is why companies need to undergo a digital transformation if they wish to continue to have success in the future. What companies need is a pragmatic Digital Strategy. To this end, information technology (IT) plays a crucial role. The right set of IT solutions enables companies to secure existing business by making a Digital Update and test new business models for the future; in other words, to venture into the Digital New. Do you have what is required to take the leap into the digital future? Are you Digital Ready? IT departments need to answer important questions. Which processes should be operated in-house, and which should be migrated to the cloud? Are we driving innovation in the company, and what do we contribute towards the final products? Digital Infrastructure allows IT departments to spearhead the digital transformation. At the same time, changing the corporate culture is just as important as the business models in order to achieve a successful digital transformation. Speed, agility, creativity, innovation, networking, and experimentation are the key pillars of establishing a corporate culture that is conducive to success in the digital age. We will help you understand the challenges of digitalization and work with you to develop strategies for a successful future. Our technology experts will help you implement the right strategies and ensure that these also lead to tangible results. Our consultants will advise you as you make changes to your corporate culture and show you how to effectively establish new paths and ideas in your company. Digital Change is only sustainable and successful if everyone pulls together. Digital Strategy - Where are we, where do we want to be? The digital transformation knows no limits. All of the departments at your company are affected by it. It is relevant not only to your IT department, but also to your product development, sales, procurement, finance, and HR departments. Our consulting team will analyze the digitalization status of your company and work with you to develop a Digital Strategy. This means we will jointly identify the areas of your company that would benefit from change. We will also determine how you can best use new technologies to secure existing business and which new business models you would like to test. 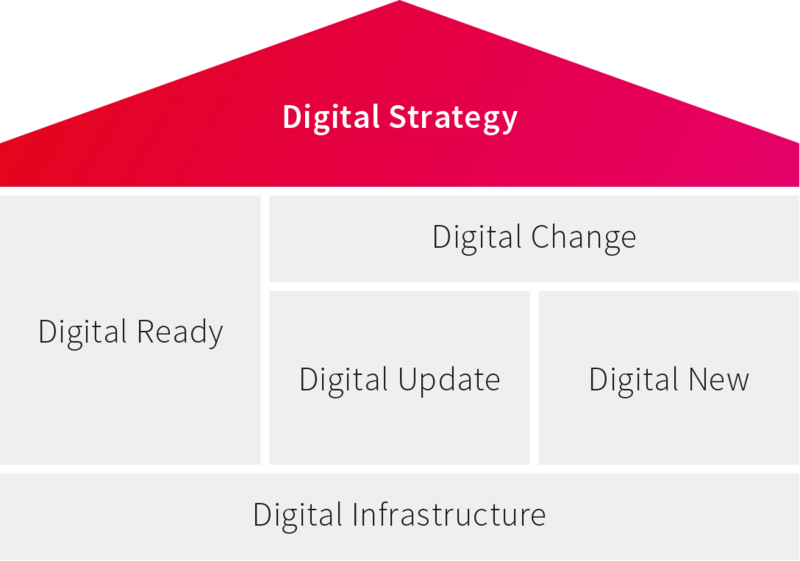 We will focus on three areas when implementing the strategy: meeting the requirements (Digital Ready), digitalizing existing business models (Digital Update), as well as developing, testing, and implementing new, digital business models (Digital New). In all three areas of the digital transformation, we will support you with change management initiatives in order to firmly establish changes in your corporate culture (Digital Change). We will introduce an integrated planning and reporting solution in order to speed up your decision-making processes. This will allow your managers to always keep an eye on your existing business as well as your new, digital initiatives and rapidly make well-informed decisions. Business intelligence solutions and planning systems will provide you with invaluable help for the digitalization process from the inside. Our social business collaboration platform will improve your project work and play a key role in facilitating the required changes in your corporate culture. Your employees will become networked, external partners will become integrated, ideas will flow freely, and collaboration will become structured and efficient, whether it takes place via mobile devices or on the Internet. In short, you will use the social business collaboration platform as an all-round dashboard to facilitate your digital transformation. You, your managers, and – on request – all of your employees will be able to view the work steps you define collaboratively, the required work streams, and the current status quo at all times. This transparency is one of the keys to a high level of acceptance. We will analyze the digital maturity of existing (customer) processes as part of a consulting project. Where do media disruptions take place? At what stages is time lost? At what points is performance lacking? Where are your customers unable to interact digitally? We will provide you with a portal to allow you to collaborate with sales partners more efficiently. This portal will present sales- and marketing-related information that is precise and always up-to-date. This will in turn reduce the workload of your sales and marketing team, allowing them to focus on their primary task: making sales! We will set up a community that enables you to offer better support to your customers. This will allow customers to share information and help one another, whether from their mobile devices or on the Internet. This will reduce the workload for your call center and allow your customers to feel more connected to your products and services. Furthermore, you will be able to gain first-hand knowledge and new ideas. You can also use the new social business collaboration platform to provide services as part of your projects. This will enable the sales, delivery, and after-sales departments to work seamlessly together. All information relevant to the respective context is available on each and every device, and you will improve quality as well as speed. You are a fast-growing company that hires many new employees. We use the social collaboration platform to facilitate an efficient and seamless onboarding process. Furthermore, we integrate a solution that enables you to use electronic signatures when hiring new employees. This will make the hiring process paperless, faster, and more cost-effective while impressing your existing and new employees. We will work with you to determine which of your IT systems no longer meet the requirements of your users in the digital age, whether this is because the systems are too slow, unscalable, or because they are incompatible with mobile devices or the cloud. We will move your old applications to the cloud, migrate the contents, add modern user interfaces, and ensure that performance and availability are once again as optimal as they need to be. This will impress internal as well as external users. Furthermore, we will archive your old data as well as your proprietary applications – whether this is in order to meet compliance regulations or for security – and provide you with a search interface that is intuitive to use. This way, your systems become streamlined, allowing you to save on unnecessary maintenance and operating costs without reducing the availability of information. The more complex your business processes, the bigger the potential benefits you can derive from investing in customized software. Rather than changing your workflows to match new software, obtain software solutions that are adapted to the users’ needs. Using customized software allows you to quickly adapt to changing requirements. Furthermore, you only pay for features that you actually need, and do not have to pay for any license fees. We produce transparent results and can react in a flexible manner at all times by using the agile SCRUM development method. Social business collaboration, process management, cloud computing, enterprise content management, and custom software make an important contribution towards allowing you to make a Digital Update to your existing business models. Our consultants will run a disruptive innovation workshop, in which we will work with you to develop a new business model and create a Minimum Viable Product (MVP) with which to test the model. We will utilize cutting-edge cloud architectures to quickly and cost-effectively create a product with the minimum requirements and features. We will then work with you to analyze the interactions with your customers and take iterative steps to ultimately arrive at the most effective business model. We will help you develop the solutions created this way and integrate them into your business processes or create new business processes based on new possibilities. Creating new business models is at the heart of digital transformation. Product manufacturers become system integrators; product suppliers become service providers. We will help you make the right decisions for the future of your company. At the same time, we will continue to expand the platform and make sure that your new IT experts are quickly integrated. Of course, we will also ensure that your operations are running smoothly. We draw on solutions based on the public or private cloud to bring ideas to life in a short amount of time and test innovative business models. We will transfer our knowledge and expertise, enabling you to take the reins of the digital transformation over the long term, whether you want to break new ground regarding sales or make your products smart. The fme operations team makes it possible for you to fully focus on your core business. Our change management team will work with you to develop a clear timetable for firmly establishing the digital transformation in your company. This involves not only the bigger picture of the transformation as a whole, but also individual projects. From program or project marketing through to eLearning, our consultants will guide you along the way and allow you to fully establish the required changes in your company. We intensively use the available social business collaboration platform as our tool. The analogy that data is the new oil exists for a reason. Data is being created constantly in all places at all times. This includes not only visible data such as orders or manufacturing bills of materials, but also data that may not immediately be recognized as data. The latter goes by the name of ‘dark data’ and includes, for example, trace and log files as well as e-mails. Dark data collected by sensors in manufacturing processes and apps on mobile devices, for example, delivers detailed information that has never been seen before. Linking this information with conventional forms of data from ERP and CRM can potentially provide a treasure trove of information that every company should use. Are the costs for the required IT resources prohibitively expensive? Not necessarily. Many resources are already available or can be acquired at low cost as open-source solutions. Furthermore, cloud solutions can be deployed in place of missing components if necessary. Ask us to learn more! Of course, we will also help you with individual areas. Do you want to revolutionize your planning processes or significantly improve your internal communication channels with a social business collaboration platform? Do you need a change management team for a particular project? Are you looking for a consultant who can advise you on how to manage your digitalization initiatives? Our component specialists are happy to help you. We look forward to accepting your challenges. Let’s work together to take the leap forward into the digital future!